The memorandum on consular cooperation between Iran and Russia will ease the visa regime. The memorandum on consular cooperation between Iran and Russia which eases the visa regime took effect on February 6, the Iranian embassy in Moscow said. "This document, which was signed during the visit by Russian President Vladimir Putin to Tehran, aims to ease the two countries' citizens' travel and eases the conditions for exchange of trade and technological delegations between the two countries," the diplomatic mission said in a report obtained by Interfax on Feb. 8. 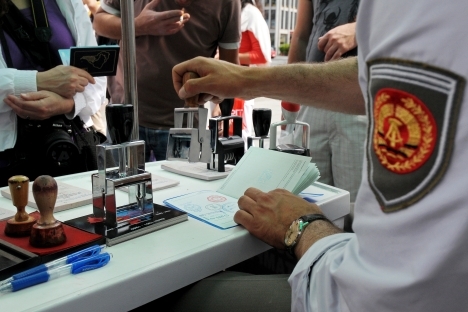 According to the memorandum, Russian authorities such as the Commerce and Industry Chamber, the Union of Industrialists and Entrepreneurs and the Public Organization of Small Businesses can provide recommendation letters to Iranian consular establishments to ease the visa procedures for businessmen. The new document also allows for the issuance of multi-entry visas to drivers of trucks and road vehicles involved in commercial activities. At the same time, a sufficient argument for the issuance of visas to schoolchildren, students and university faculty members of both countries will be a written request from a university or a receiving organization, the report says. The report also says that embassies and general consulates of Iran and Russia can issue multi-entry visas for a period of one year to citizens who are members of one of the groups stated in the text, if the visa recipient earlier received a single-entry visa for the country of entry. "The embassies and general consulates of both countries can also issue visas for a period of five years. The embassies and general consulates of both countries must issue a visa within three days from the receipt of the documents at the most. This period is ten days for multi-entry visas," the report says.